Advertise With Us! - Everything Danville, California! DanvilleSocial.com is experiencing tremendous traffic growth, engagement, and is gaining traction with the Danville market. Created out of a need to help locals find what they’re looking for, DanvilleSocial.com’s mission is to solve this by connecting customers with local businesses. We believe communities do best when local businesses are healthy. Our team has over 25 years in media, technology, and marketing experience and we’re building a destination website for the community and visitors it supports. Want to take advantage of Danville Social’s rocket-ship growth and visibility in one of the most desirable areas in the East Bay? Join us as Founding Advertisers and receive exclusive low introductory pricing. We’ve made advertising with us super easy by providing you with a simple form and with a couple of clicks your order will get processed with ads serving within 24 hours or less after approved ad. Sooner if you provide your own creative. DanvilleSocial.com offers affordable advertising opportunities for local businesses to reach our audience. We program your ad to appear in rotation throughout the ad slots you purchase on every page of our website. Leaderboard (728×90): This is the top and most visible ad slot on the website. It’s seen first and clicked on the most. 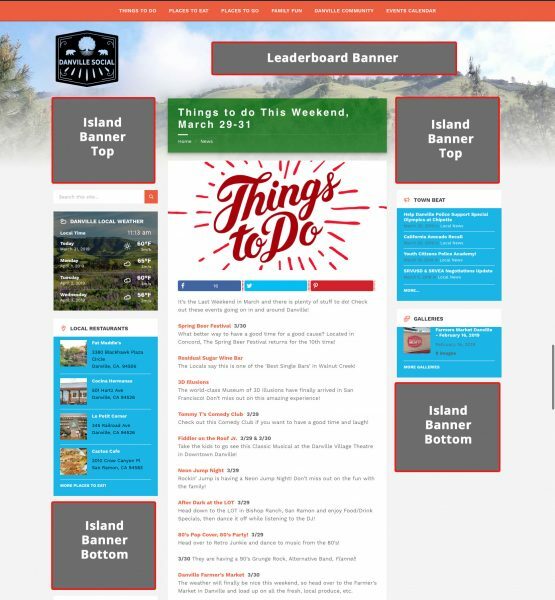 Island Banner Top (300×250): There are 2 island units located on the top half of each page. 1 on the left sidebar and one on the right. These do very well as they are in a highly visible area that does not require scrolling to be seen. Island Banner Bottom (300×250): There are 2 island units that are on the bottom half of each page. 1 on the left sidebar and one on the right. These banners are seen when visitors scroll down on one of our many long-format pages such as articles on Things To Do, Family Fun, and more. Need to target a section on our website like Restaurants and Bars or do a home page takeover? We can do that too! Contact us with more details and we’ll send you a custom quote. As founding advertisers on DanvilleSocial.com, we’ve offered a low introductory price on our corner-stone ad slots. These 5 Ad Slots are located in prime real-estate for maximum visibility. The current cost to advertise on danvillesocial.com is based on the ad slot position. Save 15% on 6-month plan and 20% on a year plan. These prices are introductory (a fraction of what other publishers charge) and will go up! If you signup with these prices now, they will not increase while you continue advertising with us. So how many times will my ad be shown? Great question! DanvilleSocial.com drives more than 30,000 impressions (display your banner opportunities) per month. With that many impressions each month (and growing every week!) your ad will be seen between 2,500 to 3,000 each month. Want to see for yourself? 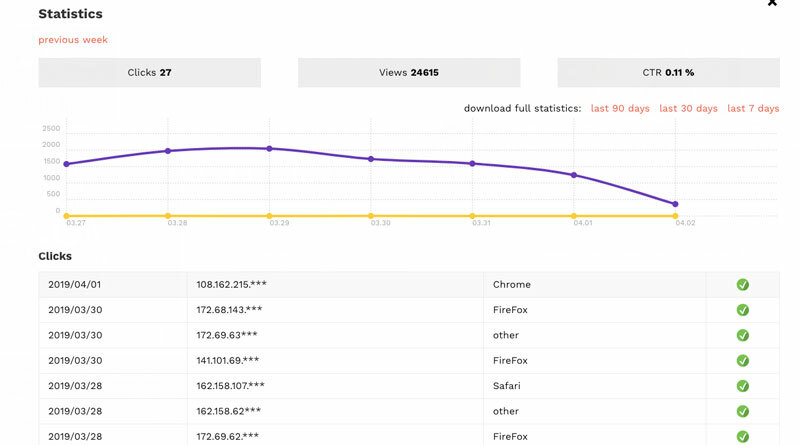 You can view your ad’s performance via your account link at any time! Space is limited to join at this price level so grab your spot today! Is there a minimum term to advertise? For our initial launch, we will have 3-month, 6-month, and 1-year plans available. With longer commitments, we give back 15% for 6-month plans and 20% on 1-year plans. After your first term…sure! All we require is a 5-day notice either by phone (925) 553-4173, email, or contact form here. If for whatever reason you wish to cancel without a 5-day notice all we require is $15 fee to cover admin fees. We’re here to stay and our livelihood is dependent on helping local businesses attract more customers. We built this experience to bring relevant content that people in our town are looking for while introducing them to things to do, places to eat, stores to shop and more. DanvilleSocial.com is growing website traffic and social channels like crazy and we’re only getting started. We’re also heavily invested in building tools and guides for our readers as well as innovating advertising channels and packages for our advertisers. Partner with us and let’s prosper together. What do I need to know about banner ads on DanvilleSocial.com? As visitors come to our website, each page has 5 ad slots that rotate every time the page loads. Each one of the ad slots can have 1 or more advertisers that get shuffled each time a page is viewed (not in front of visitors like a flashing banner, but as the page loads). You can think of it like each ad slot on a page has its own deck of cards. Every time a page is displayed a new card is shuffled to the top. Where do visitors go when they click my ad? We can direct a visitor to a specified address link like your website or if you’re listed in our directory we can send them there. I don't have a designer or ad. Will you make my ad artwork? Absolutely! When you become a Founding Advertiser we’ll do it for no additional cost. If you have multiple banners for example 1 leaderboard and 1 island unit, we will create the design and adjust sizing and for each. Need more than free like multiple versions with savings offers? We can do that too at a fixed fee of $40 per ad creative. Our secure order form provided by Zoho will process your credit card with the 1st month + 1-time setup fee of $25. Billing will automatically be charged on the anniversary date of your signup. What else do I get as a Founding Advertiser? We don’t take your investment lightly. As Founding Advertisers, you will always have our introductory pricing as well as first access to any program we develop and launch. There are other perks like private events and member deals that will only be available to Founders. Get started now with your low introductory plans starting at $60/month and put your business in front of a hyper-local and engaged local audience.